The little known sense, “interoception” might be the reason for common childhood issues with sleeping and potty training. Interoception is the sense within the human body that enables it to experience, understand and react to the physiological state of itself. It has two main functions: body state and emotional state. Body states involve the basic functions or physical conditions of the body and interoception allows us to feel and be aware of the inside of our bodies, including organs and skin. It is vital in helping us feel sensations such as pain, tickle, itch, body temperature, hunger, thirst, heart rate, breathing rate, muscle tension, pleasant touch, nausea, headache, sleepiness, and when we need to use the bathroom. The ultimate goal is for our bodies to reach homeostasis, an internal balance of systems using the least amount of energy. When our internal balance, or homeostasis, is off, our interoceptive system signals our body to take action. For example, if we experience a dry throat and mouth, our interoceptive system, if working properly, will tell our brain that we are thirsty and we need to get a drink of water, which results in decreased discomfort and reduced dry throat and mouth. However, if our interoceptive system is not working properly, signals can be misinterpreted by our bodies, resulting in what presents as an “outburst,” “tantrum,” or “shutdown”, agreeably inappropriate reactions to thirst. Likewise, if our interoceptive system sends a signal indicating a full bladder and the message is not processed correctly, the appropriate response of heading to a bathroom might not occur. A chronic inability to react appropriately to a given signal can lead to emotional distress and compensatory behavior such as moodiness, nervousness or distraction. Emotional states involve our moods and the emotional conditions of our bodies. The interoceptive system helps us to regulate our emotions, identify our emotions, and determine how we view other’s emotions. It helps us identify anger, embarrassment, happiness, anxiety, excitement, sadness, and fear. For example, a fast heartbeat, tingly stomach, and shaking muscles could mean you are anxious, while slow/rhythmic breathing and loose muscles could mean you are relaxed. Our ability to self-regulate is closely tied to our interoceptive system. If our interoceptive system is working properly, we are aware of our internal signals (thirst, hunger, full bladder, heart rate, etc.) and able to guide our reaction to those signals. A person with poor emotional awareness could have an interoceptive system that is working inefficiently and therefore not providing clear body signals. Without clear body signals, they may not notice subtle differences in the way each emotion feels and can result in difficulty identifying and controlling those emotions. Without clear and understood awareness of their internal state, it can be impossible to develop good self-regulation skills, therefore impacting a child’s ability to successfully engage within their social and physical environment. Helping your child begins with learning about treatment options. Occupational therapy, with a focus on sensory processing and with the use of mindfulness activities, can help facilitate interoceptive processing and awareness. 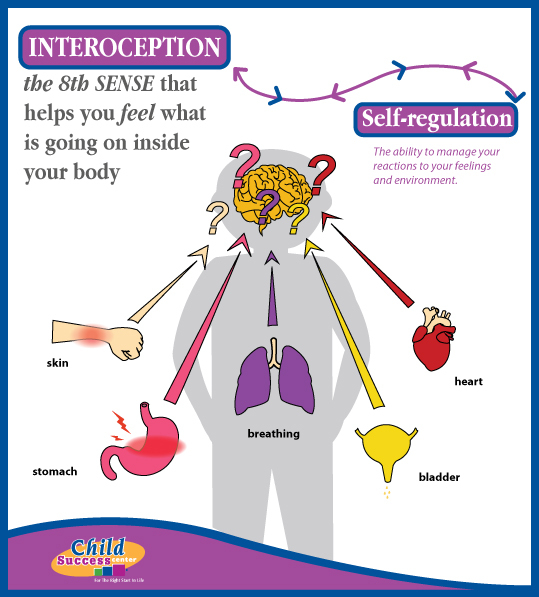 Child Success Center offers many options in the way of treating sensory processing issues and building your child’s interoceptive system. Call today to learn more about our individualized, peer-to-peer and group programs.